Currently Australia is free of many serious honey bee pests that damage the health of European honey bees overseas. A number of programs have been developed to help protect Australia’s honey bees from exotic pests, and to preserve the pollination benefits they bring to many crops. Together, these activities enhance the preparedness of the honey bee industry for exotic bee pests, provide support for international trade and protect the pollination reliant industries from the impacts of an exotic bee pest incursion. To help beekeepers to implement biosecurity measures and to ensure that they are complying with the Code of Practice and relevant legislation, Bee Biosecurity Officers are employed within six state departments of primary industry. The biosecurity officers are there to provide training and education. If there is an exotic pest incursion, the biosecurity officers will be on hand to provide expert support to industry, and to help design and implement response measures. An online training course has been developed to make it easy for beekeepers to find out how to care for honey bees in accordance with the new Australian Honey Bee Industry Biosecurity Code of Practice. The Biosecurity for Beekeepers course explains why biosecurity is important, describes the main pest threats to bees and shows how to check hives for signs of pests and diseases. It’s designed for people with a basic understanding of beekeeping practices, but all beekeepers should find it helpful. 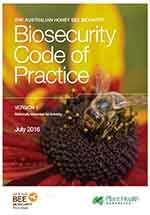 The BeeAware website is also where you will find information on the National Honey bee Industry Biosecurity Code of Practice, the Bee Biosecurity Video Series, the BeeAware Newsletter and other resources. More information about the honey bee industry in Australia, including a list of the exotic and endemic pests of bees, is available from the Honey bee industry section of this site.